Do you think Apple has peaked and price will be a lot lower a year from now? Or perhaps you think Netflix will continue to rip higher over the next 12 months? How about Amazon? Can Jeff Bezos continue to prove his worth and take Amazon to $1000 a share? And then there is Google. Has it become a dinosaur like Microsoft or can they take revenue to another level? How can we not include Elon Musk’s Tesla – can the stock fly to the moon or will its heavy debt drag it back down to earth? Finally, let’s not forget all the biotech stocks that are on the verge of soaring to new heights with their drug discoveries, but of course they can just as easily tank with a “NO” from the FDA. Let’s face it, all these stocks and many others will move significantly up or down over the next 12 months. How do you profit from these huge moves? Sure, you can just buy or short the stock, but what if you are wrong? Plus, it’s going to cost you $100,000 just to buy a couple of hundred shares of Amazon … does this even make sense?? How about buying some long-term call or put options? Or even a straddle? Seems like a good idea, but their premiums are very expensive and are also vulnerable to Delta, Theta, and Vega risks. Know this: 85% of straddles lose money so the odds are not on your side. If all of the above made absolutely no sense to you, then what I am about to say is probably not for you. profit from HUGE stock moves using options, then read on. Do you think there will be stocks that are going to have BIG moves (up or down) over the next 12 months? Do you want to make HUGE profits on trading these BIG moves using options? Do you want to make money even if you are completely WRONG on direction? Matt’s Trading BIG Moves With Options course is for you. money with options regardless of whether the stock moves up or down. Great course Matt! Never knew I can trade options this way – it was really eye opening for me. I am making lots of money with your AOSB swing strategies, and I find this strategy to be a great addition because now I can also trade bigger moves! First time I used this strategy I made 133% on IBB thanks Matt! Don’t miss out on huge stock moves again! 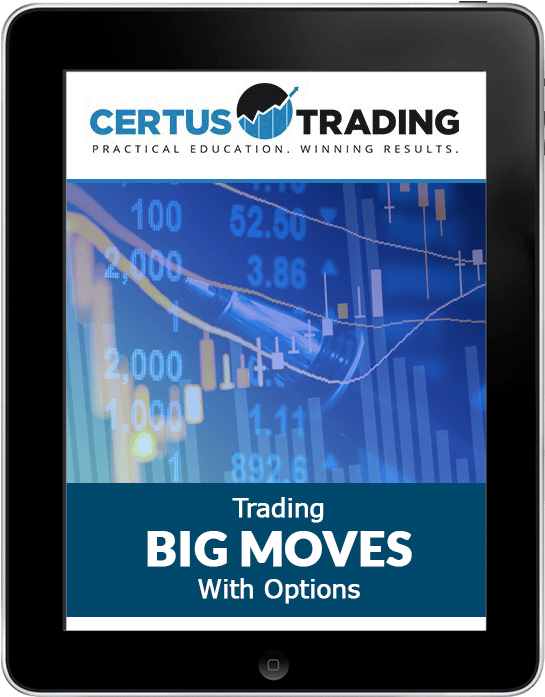 course Trading BIG Moves With Options!